It’s Final Member’s Draw time again! 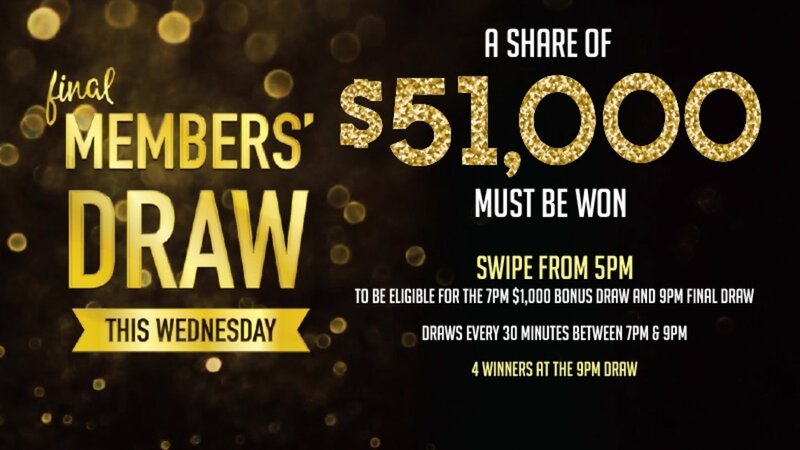 Tomorrow night from 7pm, all of our members have a chance to Win a Slice of Cash, with $50,000 up for grabs. Every half an hour between 7pm-9pm, a random number will be drawn and if that member is in the club and comes to claim their ticket, they’ll take home the jackpot at that time! If the jackpot amount has not gone off before the final draw at 9pm, four tickets will be drawn from the barrel and four lucky members will take home a slice of the cash. We’ll also have a $1,000 bonus draw at 7pm for all of our early bird swipers! Members can swipe their cards on select screens inside the club from 5pm. If you’re not a member of our club yet, joining is quick and easy. Simply visit our main reception and fill out an application form and we will process your request on the spot. If you join before 6.59pm you will be eligible for the 7pm bonus draw, and the 9pm final draw.